Twice a year, Northpark Center hosts Fashion at the Park. It's our fashion week. NPC's website says, " Nonstop excitement, on and off the runway. Rub shoulders with fashion luminaries, celebrities and fashionistas at Fashion at the Park’s runway shows, parties, events, beauty classes and trunk shows. 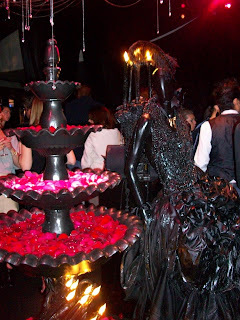 See and be seen in the Lounge, where guests enjoy the energy of the fashionable crowd while DJ Lucy Wrubel entertains." Randy sells the corporate sponsorships for this event, so he has to go to all the shows (lucky). I try and make a few of them each season. 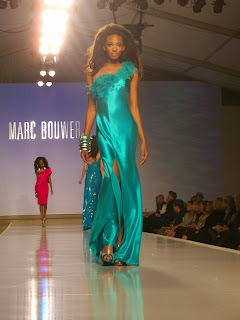 Last night was the finale - the swan song soiree - Neiman Marcus featuring Marc Bouwer. At the finale of the show, models do one more walk for a last looksey. Marc Bouwer came out to take a bow. 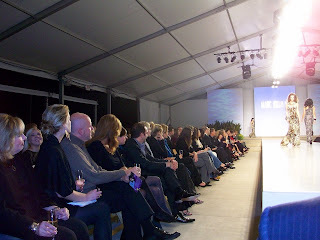 After the fashion show, guests moved to the outside area where they had tables and seating set up on the lawn. Hunter Sullivan entertained the crowd with his Big Band standards. It was fun to get all dressed up and sip champagne. This event... is right up my alley.